Since making her professional artistic debut many years ago by selling out of her paper collage-style prints at the first arts and crafts show she ever attended, Cori Dantini's artistic profile has only climbed. The Pullman-based graphic designer and illustrator has racked up nearly 7,000 sales on her Etsy shop, had her work printed on Kleenex boxes, and now fans can find her whimsical and playful designs on bedding sold by mega-retailer Target. Besides this impressive list, Dantini's art is also found on fabrics and greeting cards. The Inlander knew Cori's work was special early on, having commissioned her to design the cover of our 2012-13 Annual Manual, along with inside artwork for that year's issue. 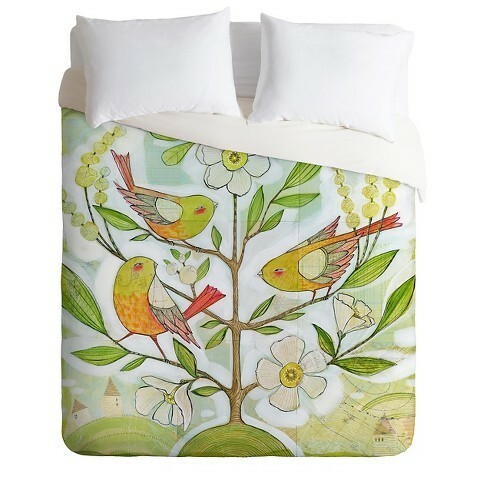 Currently, an online search at Target.com shows that Dantini has eight bedding items showcasing her work, sold as part of the DENY Designs line. Many of the Denver-based company's artist-designed housewares products are also sold through Target. Four of Dantini's soft, nature-inspired designs are printed onto duvet covers ($140-$180) and pillowcase sets ($30), which as of this posting are on sale for 10 percent off.